Should I Hire A Running Coach? What Can A Coach Do For Me? RB15: Should I Consider Hiring A Running Coach? When Does Coaching Make Sense? A listener named Nate recently reached out to me and asked what exactly a running coach can do, especially for a non-competitive runner who is not a professional athlete. He wanted to know whether or not he should find a running coach to help with his training or if he should continue to do his own thing. He also wondered why someone would consider hiring a running coach in the first place, when there are countless training plans, books, and resources available to help runners accomplish their training goals. These are all great questions, and, in today’s episode, I share my opinions and thoughts on the matter. 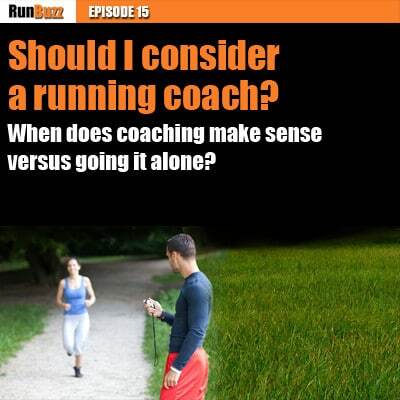 While I am a coach myself and believe everyone can benefit from having a coach, in this podcast, I hope to put aside my own biases and provide an objective view on what a running coach can bring to the table. I’ll go over what a great coach can do (and not do) for you, what that they offer, and what types of coaching are available. Like I said before, I honestly believe everyone can benefit from having a running coach. Whether you’re just starting out or are a seasoned pro, a running coach can provide an objective look at your training and accelerate the speed at which you progress. Running coaches work with all levels of runners, regardless of skill or ability. I, personally, have worked with people who were very obese and never ran a day in their life to Boston Marathon qualifiers. However, most people I work with fall in between those two spectrums. Coaches are there to challenge you when you need to be challenged or throttle you back when you need to take your efforts down a notch. People derail their training both by what they don’t do and by what they actually do. A running coach will keep you within reasonable limits of your ability, balance out your training activities, and keep you on track of your goals by measuring and evaluating your progress. From there, coaches will make adjustments to help you determine what training methods work best. They’ll keep your training focused so that every little running tip you hear or read about doesn’t counteract with what you’re trying to accomplish. However, at the end of the day, keep in mind that your coach can’t do your work for you. You’ll need to have equal ownership in the relationship. Truth be told, I’ve fired clients who failed to consistently do their workouts and, instead, came back to me each week with excuses. I have chosen to be highly selective with my time and don’t waste it with people who just want to write checks but not do the work. When they fail to progress, it also makes me look bad, so I would much rather focus my time and attention on people who want to improve and are willing to put in the effort. Above all, don’t underestimate the power of a coach. I have taken an hour off marathon times and minutes off 5k times, simply through phone calls and customized training plans, without even meeting the runner being coached in person. It really is amazing what a coach do for you and your running. Just as there are many different types of runners, there are many different types of coaches. Because of this, not every coach will be right for you. Running coaches should partner with you, not just tell you what to do. In other words, you should have equal say and participation when working with your coach. If both of you are on the same page, the coaching relationship (and your progress) will be successful. Make sure to find a coach that establishes his or her training on sound, scientifically based, and proven principles in the fields of exercise science, physiology, nutrition, and so on. Coaches should not be restrained to just one way of doing things, but should be willing to adjust their approach, if necessary, to do things that are right for you. Simply put, there’s more than one way to train and, sometimes, an alternative way is simply best for the athlete. For me, it’s about getting the best out of the athlete in a way that’s best for the athlete. It’s also important to note that, just as there are varied approaches to training, there’s very little standardization in the industry as to how someone becomes a coach and delivers training. Fortunately, a few certifications do exist that can help determine if a coach is qualified. Accrediting agencies like USA Track and Field and RRCA ensure that coaches meet a minimum standard. I, personally, invested time in acquiring both certifications, but they really were just the beginning of my journey to becoming a better running coach. Conversely, just because a running coach isn’t certified doesn’t mean they aren’t qualified to coach. There are hundreds or thousands of people out there who are not certified but are great coaches. While accreditation does help establish that a coach has tested to a certain level of proficiency, other aspects play into what makes a coach great. Experience is probably the biggest example of this. However, other things can also establish a coach’s credentials. For example, degrees in physiology or exercise science or personal trainer certifications can help demonstrate a coach’s qualifications. Even self-study and personal experience, when done right, can lead to someone becoming entirely capable of coaching others. As a word of caution, just because someone is a great runner, does not necessarily make them a great coach. Simply because a person has great talent and physical ability as a runner does not mean they can coach others sufficiently. An effective coach has other skills, besides running capability, that make them a great mentor. Every coach is different, so you’ll need to take some time to find one that you feel works with your personality and skill level. You should feel confident in them and trust that they have your best interest at heart. There are a wide variety of options when it comes to coaching and the services offered. So, let’s go ahead and take a look at all these types, from no formal coaching at all to to one-on-one training. Like everything, there’s a relative scale when it comes to price. Often, the more personalized the service, the more expensive it will be. Most coaches, including myself, will offer several options so they can hit all possible price points. Not all runners have the budget for private or group coaching, and, sometimes, a customized training plan will get them a little further along than a free mileage based plan written for anyone. In other words, you’re entirely self-taught. Obviously, there’s no cost to this method, and it’s where most runners start. While there are plenty of great books available, in this approach, your training is pretty much left up to you. With a generic training plan, you might get a mileage based program but usually not more than that. Also, these types of training plans are not customized to you. They fail to take into account your age, fitness level, genetics, or availability to train. They simply give you miles to run and the rest is up to you. Need help with nutrition? Injuries? Running form? Well, you’re on your own. While this approach works for some, it does not optimize your training. Instead, it requires you to figure out what is fiction, what is reality, and what the best way to train is for you. For most, this leads to years of trial and error and frustration. Also, be aware that several training plans, including some popular ones, were not written by coaches or even runners. This is crazy. These people are the snake oil salesmen of our times and are just trying to make a profit. Even many free ones, while they might not come at any cost to you, are offered as a way to attract web traffic to generate money through ads or sponsorships. Always know who is behind the plan. Ask! If they’ve got nothing to hide, they won’t mind. A customized training plan is the first entry level type of formal coaching. In most cases, you fill out a questionnaire and then meet with the coach, either via email exchanges or by telephone. After a brief discussion, a custom plan is created, based on your individual background and training goals. Often times the interaction between you and the coach ends there, and you’re left on your own to figure out the rest. However, with some offerings, your plan may come with a certain amount of email or phone support. At RunBuzz, we offer custom training plans for those looking to elevate your running beyond generic training plans or self trained options. Many running clubs have coaches associated with their establishment. They also often have experienced runners who are available to help new runners get started. However, these people may or may not be coaches. A running club is a great way to get started with formal coaching, often at a low price point. You can expect to receive guidance and support with the basics. You’ll usually follow your own training plan or one that was provided for the entire group. One advantage of a running club is that you often get group training plus a built in accountability system. If you’re looking for a running club, check out the Road Runners Club of America (RRCA) to see if there are any around you. If you don’t see one listed on the RRCA website, try searching on Google or ask at a local running store. Most running clubs love to have new members and are very welcoming. Group coaching offers a similar dynamic to running clubs. The training can be run by private coaches, fitness professionals (such as personal trainers), or even charity organizations. They often target the training based on the needs and goals of the entire group, not each individual. One-on-one coaching is available in person or online, the former option being the more expensive of the two. You get much more personalized attention with this type of coaching than with others, and, because of this, it’s usually the most costly coaching option. I’ve seen programs from $50 per month all the way up to several hundred per month, so price really comes down to what is being offered and what the market will allow. Individual coaching usually provides the best results – if you find the right coach. For those looking for individual coaching, we offer our PaceBuilders Training Program. Not only will a good coach put together a training program for you, but he or she should also only give out 2-4 weeks of a this plan at a time (if you are working with them on a one-on-one basis, that is). This is the best practice because it allows adjustments to your program as you progress through your training. If the entire plan is finalized and distributed at one time, then your training will not be as effective as it can be. In reality, no one ever progresses exactly as planned over the course of training. Sometimes you will be ahead of schedule and sometimes you will fall behind. While some longer range milestones will be shared to keep you focused on an overall target, your training plan should be dished out in chunks. A good coach will factor in your level of stress, your amount of travel, the number of days per week that’s realistic to train, your current level of fitness, your fitness history, any preexisting medical issues, your age, and your ability to recover. Anything that can impact your training and progress should be factored in, beyond just running miles. Running coaches are not nutritionists, but they can give general guidance. They can help you with fueling and hydration and, if necessary, refer you to a nutritionist if they suspect you may be having problems. A great coach will know when their level of expertise should be replaced by someone more knowledgeable. Coaches should never give out meal plans or use any form of nutrition to treat disorders, physical or otherwise. Unless they are a specialized nutritionist or a doctor, this is way outside most running coaches’ scope of practice. Running coaches are not doctors, but they can, again, provide general advice. A coach should never “diagnose” or “treat” your injuries. While one may be able to recommend that you cut back training and follow the RICE principles (Rest, Ice, Compression, and Elevation), a coach should never recommend specific treatment or suggest that you do not need to see a doctor or medical professional. Anytime pain is severe enough to impact form, you should stop running and see a doctor. 5) Help with motivation, goal setting, accountability, race preparation, race strategies, race recovery, and mental training. There is more to running than just logging miles. A good coach will help you with every detail, no matter how small, to help you reach your goals. Coaches should proceed very cautiously when it comes to your running form. Basic guidance can be given (as in, “try to have loose shoulders and arms” or “lean forward slightly”), but, when it comes to more specific form correction, many coaches step over their boundaries. Significant form correction should be left to physical therapists and medical professionals. Coaches can help with the basics but, unless they are a medical professional, they simply cannot know how your body is put together the way it is and why. Sometimes, changing a runner’s form is more dangerous than the original condition. If form is changed, it should be done carefully and very slowly and under the guidance and supervision of a qualified professional. A good running coach should be able to ask questions and pull information from you so that they have what they need to build your plan and manage your program. A coach who is a good listener will be able to pick up on little things (like inflections in your voice or common phrases you use) that may point to what is really going on. If necessary, he or she should be able to focus in on these clues and seek out more information so as not to miss what may be going on behind the scenes. A good coach will factor in all of the elements mentioned above to create a customized program that works for you. Notice that I did not say training plan here. A plan is your workout tasks and calendar – a program is all inclusive and includes all the factors that impact your running. A running program should ALWAYS be more than just a mileage calendar. Now, despite all the benefits a coach bring to your training, you do not necessarily need one. You could successfully do everything all by yourself, and many runners do. However, if you struggle with willpower, accountability, or motivation, a coach can make the difference between sticking with a running program or quitting. Regardless of whether or not you hire a coach, always, always, always be a student of the sport. Continue to learn as much as you can, seek the guidance of others, and forever learn about your body and what makes it work.